Tiberias - Town on the shores of the Sea of Galilee, founded by Herod Antipas in 26, and named for Tiberius Caesar . Replaced an existing town of Rakkath. The town has an elevation of about 700 m at the sea shore and 1500 meters inland. ,Jews refused to live there for a time apparently, because the city was built on gravestones. The town plays an important role in Jewish history. It was a center of the Jewish rebellion in 68-73 AD. The Sanhedrin (the Jewish religious High Court in the period of the Second Temple) relocated to Tiberias from Sepphoris. The Mishna was completed in Tiberias in the third century under the supervision of Rabbi Yehuda Ha-Nasi ("Judah the Prince"). The so-called Jerusalem Talmud was compiled in the fifth century. The Samaritans had a center in Tiberias in the middle of the 4th century. The Crusaders later captured the town, making it the capital of the Galilee, but Saladin retook Tiberias for the Muslim Empire in 1187. The great Jewish sage Maimonides was buried in Tiberias in 1204. The Jewish community of Tiberias suffered the vicissitudes of Christian and Muslim rule, as well as the ravages of natural disasters. In 638, all the Jews and Christians were supposedly driven out by the Kalif Omar ibn Kataf. However, when the Crusaders conquered the country, Jewish inhabitants were found in Tiberias, The traveler, Rabbi Benjamin of Tudela reported 50 Jewish families in Tiberias. Tiberias was destroyed in the Crusader wars. It was still virtually uninhabited in 1523. Tiberias was rebuilt through the efforts of Donna Gracia Mendes, and her nephew, Don Joseph Hanassi, Portuguese who fled the Inquisition. Donna Gracia had been forced to convert to Catholicism. Fleeing the inquisition, she returned to Judaism and lobbied for the restoration of Tiberias. Sultan Suliman had it surrounded with a wall in 1540, and it experienced a revival, being settled by Jews expelled by the Spanish inquisition. However, it was again destroyed in 1660. 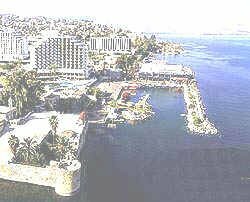 In 1742, Rabbi Chayim Abulafia, of Smyrna (Izmir), settled in Tiberias under the protection of Dahar el omar. He had the city wall restored at his own expense and repopulated the Jewish community. The distinguished family of Abulafia produced a large number of learned men. In 1780, a group of Jews from Poland settled in Tiberias. In 1834 there was a rebellion of Palestinian Arabs. They locked the Jews in the Jewish quarter and demanded an immense ransom. The Jews submitted. When the city was retaken from the rebels, their extorted property was returned to them. In 1837, Tiberias was almost entirely destroyed by a large earthquake. Almost 500 Jews were killed, and the wall was destroyed. In 1866, a cholera epidemic caused the community of Tiberias to appeal throughout Europe for aid. Tiberias has two congregations; 1, the Sephardim, with a handsome Synagogue and 80 families; and 2, the Ashkenazim, with two Synagogues and about 100 families, who are all Poles and Russians. The Jewish inhabitants of Tiberias enjoy more peace and security than those of Zafed. By the beginning of the 20th century there were 2,000 Jews in a population of 3,600 according to the Jewish Encyclopedia, published in 1911. Tiberias was taken by the Haganah in April of 1948. The Arab inhabitants fled. Today, Tiberias is a town of about 50,000 inhabitants. A photo of modern Tiberias is shown at right. Please tell us about your favorite links and we will review them for inclusion. Please copy these links as well.